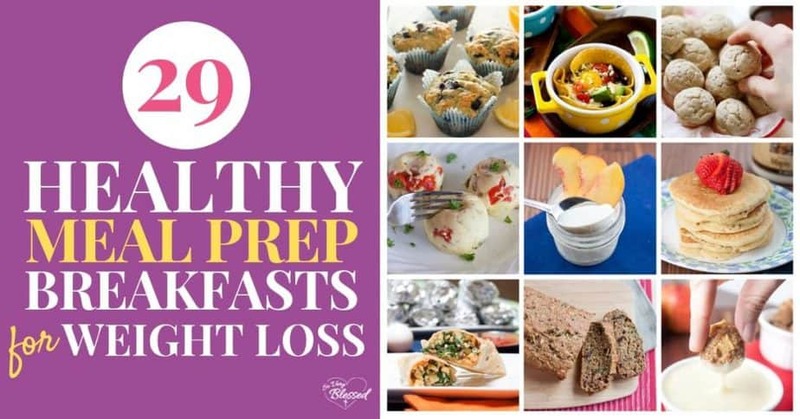 Healthy breakfast meal prep ideas for your weight loss journey that will make your mornings stress-free and get you on the right track for the rest of your day. Breakfast is the one meal I meal prep every single week, without fail. It’s not secret that I’m not a morning person, so if I’m going to have a healthy breakfast, it needs to be ready to eat when I wake up. Before I started meal prepping breakfasts, I would grab quick and easy (and usually not very healthy) options like cereal, granola bars, and bagels. None of those things would keep me full for very long and I ended up overeating later because of it. Meal prepping breakfast was SO good for my 100-pound weight loss journey and especially for maintaining that weight loss afterward. I typically spend less than an hour every Sunday afternoon cooking breakfasts for my husband and I to eat all week long. I like to divvy them out into glass containers which helps with portion sizes and it makes them so easy to grab in the morning. These are the meal prep containers I use! 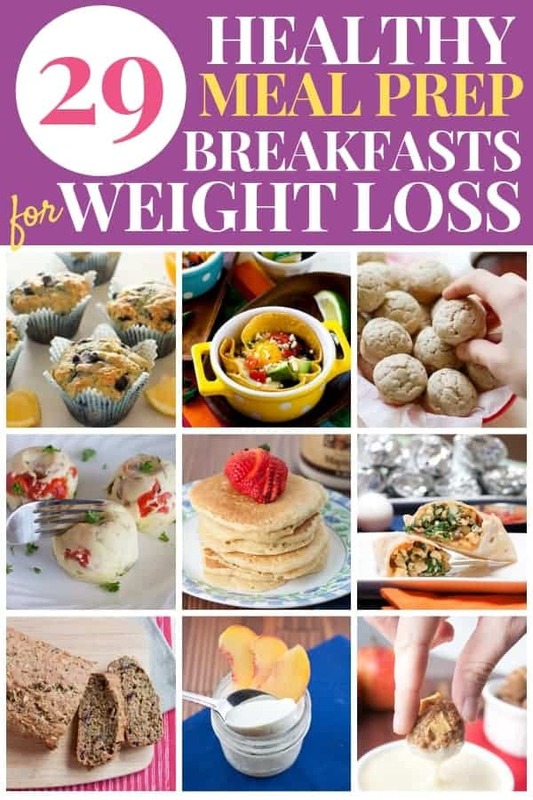 Here are some great meal prep breakfast ideas to help you stay on track with your own weight loss goals! 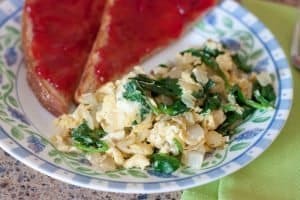 These Single-Serving Spinach Scrambled eggs are a fast, easy, & healthy breakfast for weight loss full of protein to start your day on the right foot. This is one of my most commonly used meal prep recipes! I scramble enough eggs for the entire week and I’ll add whatever seasonal veggies I have on-hand – zucchini, spinach, kale, broccoli, carrots, bell peppers, and more. 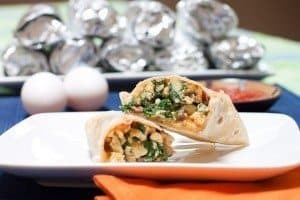 These freezer breakfast burritos are the perfect healthy make-ahead breakfast to start your morning off right with both protein and vegetables! Breakfast burritos are such a handy meal prep recipe because they freeze so well and they are easy to eat on the go. If you are reheating them in the microwave like I usually do, I highly recommend wrapping them in a damp paper towel before microwaving to keep the tortilla soft and delicious. 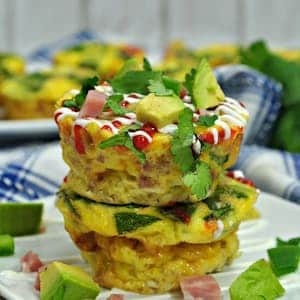 These low carb Southwest egg muffins by The Holy Mess are the perfect on the go breakfast that works with a variety of dietary needs. Making breakfast in muffin tins is great because it makes things into portion sizes that are easy to grab and heat. 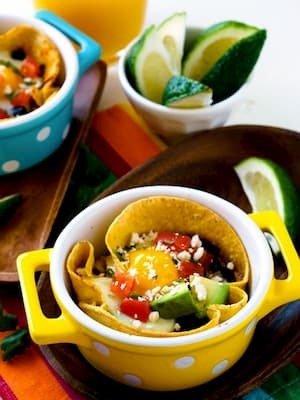 Go to bed excited for the morning with this delicious make ahead breakfast taco egg bowls by Carmy! The perfect meal prep to get through the mornings. 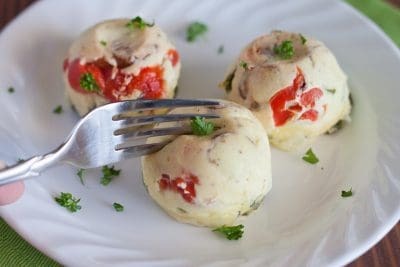 This Instant Pot Egg Bites recipe with baby spinach and roasted red peppers is an easy and delicious recipe that you can make ahead for healthy meal prep. 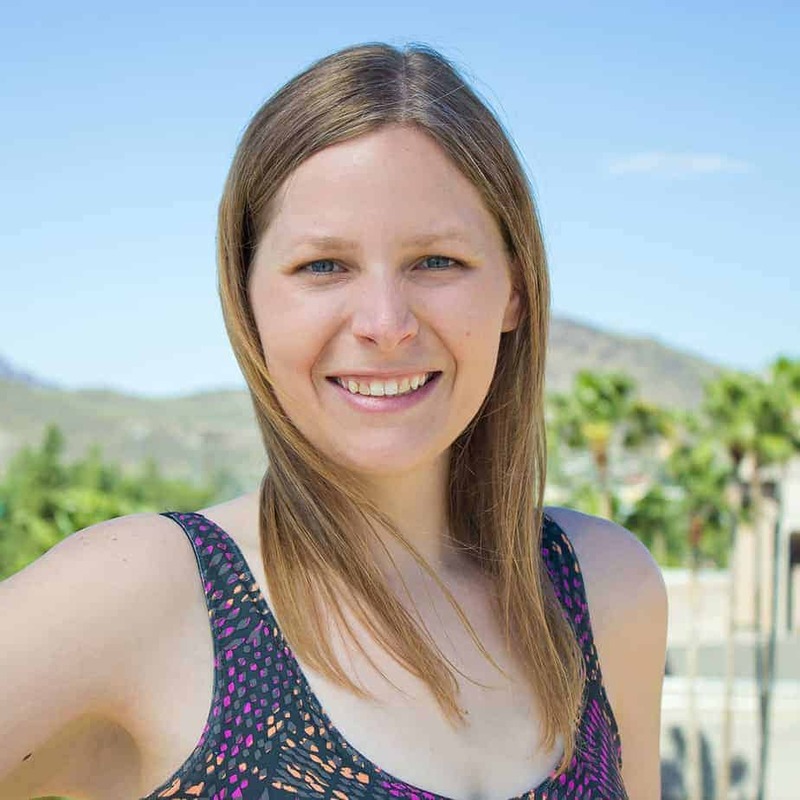 I love using my Instant Pot to make breakfasts ahead of time. It saves me so much time! I have made so many different variations of these egg bites. The texture is lovely and soft and they are packed with protein to keep me full until lunch time. 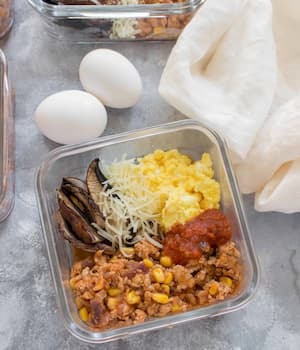 These Healthy Huevos Rancheros Breakfast Bowls from Food Folks & Fun are not only easy to make, but so satisfying and surprisingly good for you! 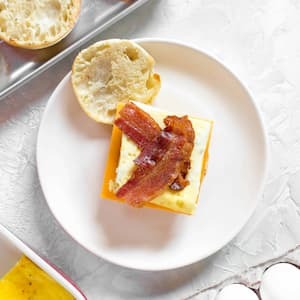 Skip the drive thru in the morning and make your own freezer friendly breakfast egg sandwiches from Carmy. Make a batch, freeze it, and have a sandwich for breakfast everyday! I would definitely add some veggies to the eggs in these (it adds flavor and nutrients! ), use whole wheat english muffins, and just use a sprinkle of shredded cheese. 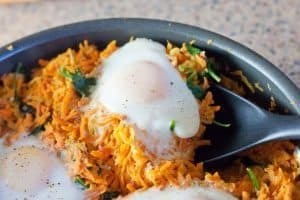 Make this one pot Sweet Potato Breakfast Skillet for a simple & fresh healthy meal to brighten up your morning with protein and veggies! I’ve made this skillet so many times because the combination of the apple and sweet potato tastes incredible! Sometimes I break the eggs on top and sometimes I scramble them separately, but it is always delicious. These healthy egg muffins with turkey bacon from Diabetes Strong take hardly any effort to make, taste amazing, and can be stored and reheated the next day. 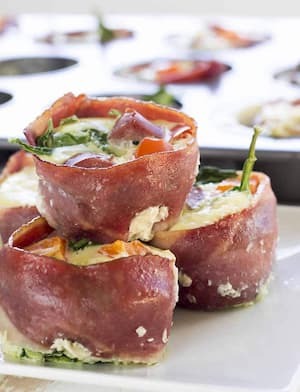 Wrapping the egg muffins in turkey bacon adds fantastic flavor and gives you a deliciously low carb, protein-packed healthy breakfast. 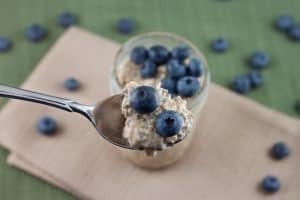 Prep this make ahead breakfast in 5 minutes the night before and you have a healthy and delicious Peanut Butter & Blueberry Overnight Oats in the morning. Overnight oats are a fantastic choice for a healthy make ahead breakfast. I like to make them right in mason jars so I can just grab a jar and eat on the go. 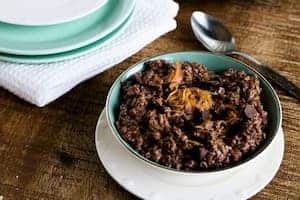 This delicious chocolate Peanut Butter oatmeal from The Holy Mess is made quick and easy in your Instant Pot. With just 4 WW Freestyle points per serving, this is a real treat that will keep you going all day. I’ve made this recipe a few times now and my husband (a sweetaholic) absolutely loves it! I like to top it with chopped strawberries. These protein-packed quinoa bites bursting with apples and sweet cinnamon are a healthy & delicious make-ahead breakfast. I like to make a double or triple batch of these and freeze them. You can grab however many you need and heat them up quickly on those last-minute rushed mornings. 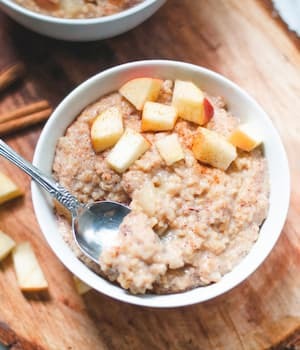 Make these easy vegan apple cinnamon steel cut oats from the Cozy Peach Kitchen in the Instant Pot in just 30 minutes! With this oatmeal recipe, you’ll have a healthy and filling breakfast in no time. The Instant Pot makes cooking steel cut oats so much faster and easier! I love pouring in the ingredients and walking away without having to babysit the pot! 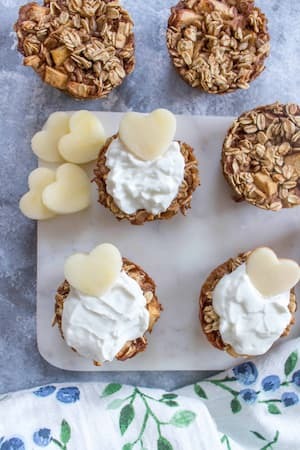 Start your morning off deliciously with these freezer friendly healthy baked apple oatmeal cups from Carmy! They are delicious with a little bit of yogurt! This easy egg alternative will save time in the mornings. 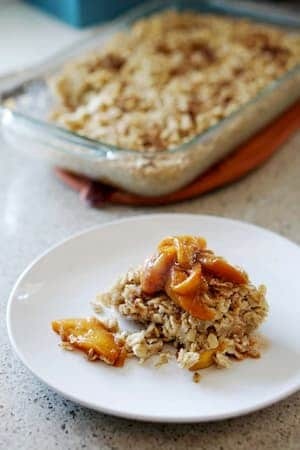 This gluten, dairy and refined sugar free healthy baked oatmeal from Eat Your Way Clean is made with peaches and rhubarb recipe is vegan with just enough cinnamon and nutmeg. It’s so easy to make a pan of baked oatmeal and divide it into portions for the week. 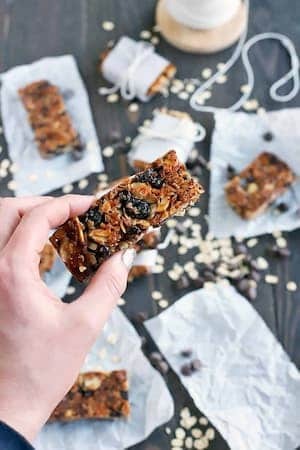 These gooey, slightly sweet, and crunchy, homemade fruity chocolate chip granola bars from Foodal will kick the pants off any store bought version you’ve tried. 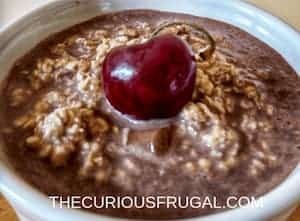 This recipe for cherry chocolate overnight oats from The Curious Frugal is a set it and forget it recipe. Stir a few ingredients into a jar, put it in the fridge overnight, and in the morning you’re treated to a yummy healthy breakfast! 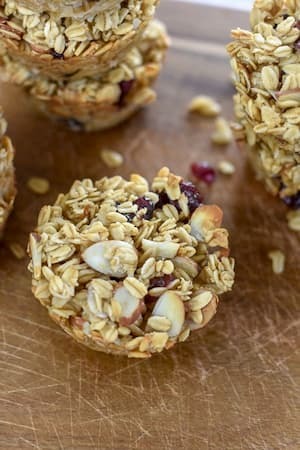 These uick and easy make ahead breakfast muffins from Dash of Jazz are baked with simple ingredients like sliced almonds, dried cranberries, and maple syrup. 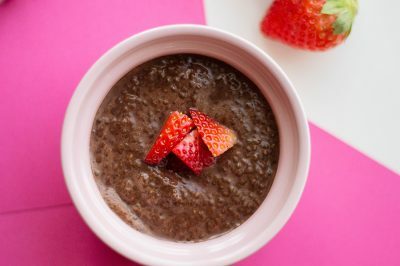 This Chia seed pudding from Fabulous Habits is super easy to make and absolutely delicious! These Healthier Fluffy Pancakes are a healthy breakfast made with white whole wheat flour to keep them fluffy, delicious, and nutritious. 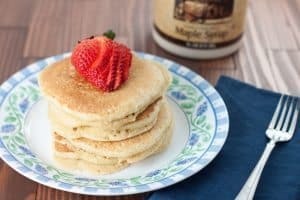 These pancakes are easy to make a big batch and keep in the freezer or refrigerator, ready to heat and eat when you need them. 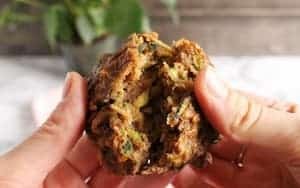 These delicious 1 bowl zucchini breakfast cookies from Naughty Nutrition are the perfect treat for when you want breakfast, veggies and something quick and on-the-go all at once. I’m a huge fan of getting veggies into my breakfast, especially when they’re in breakfast cookies! 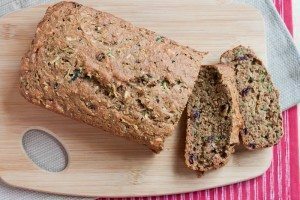 This healthy breakfast bread uses white wheat flour, which is more nutritious and it keeps you full longer than breads made with all white flour do. This bread freezes beautifully and is absolutely delicious sliced and toasted first thing in the morning. 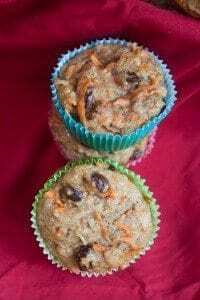 These muffins from Brooklyn Farm Girl are only 48 calories a piece! These easy to make healthy muffins are perfect for apple picking season! They make a breakfast or a afternoon snack. 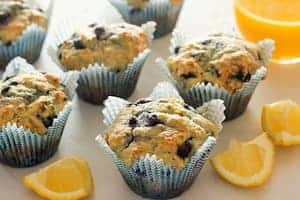 These muffins are sweetened with fresh fruit instead of sugar, making a grab and go healthy breakfast. A little breakfast meal prep and you’ll always have an easy morning! 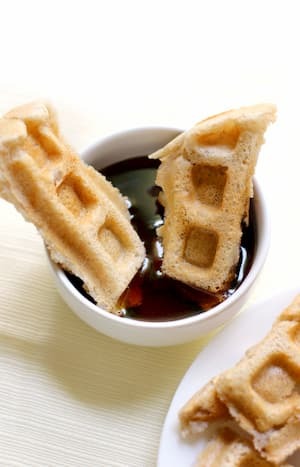 These Freezable Applesauce Waffles from Strength & Sunshine are gluten-free, vegan, allergy-free, and dippable! Delicious on a Dime These Healthy Lemon Blueberry Muffins from Delicious on a Dime are like a warm sunny day in the middle of winter. 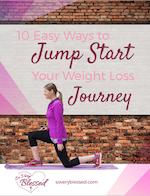 Into clean eating or just looking for a new breakfast idea to make your mornings easier? These muffins are healthy, easy to make ahead to time, and affordable! A win-win-win! 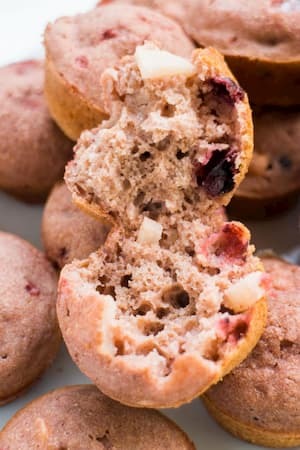 These whole wheat morning glory muffins made with Greek yogurt and fruit are perfect for healthy breakfast prep. 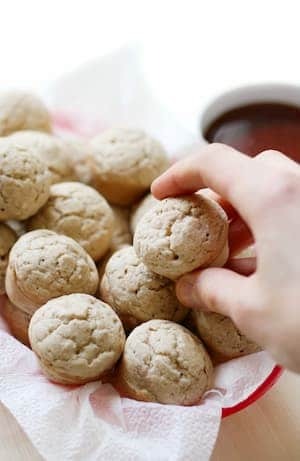 These Mini Gluten-Free Cinnamon Pancake Bites from Strength & Sunshine are vegan, allergy-free, 8 ingredients, and take just 10 minutes to bake! They’re a surprisingly healthy breakfast recipe that kids (of all ages!) will love! Perfect for little hands to dunk in syrup and munch! A healthier way to have pancakes for breakfast – and in bite form, no less! 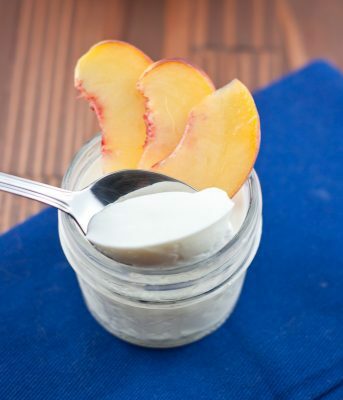 This Cold Start Instant Pot Greek Yogurt Recipe is an easy and budget-friendly choice for a healthy Instant Pot recipe for breakfast. This yogurt is a staple at our house! It is so fast and easy to prep and making it in jars is perfect for meal prep. 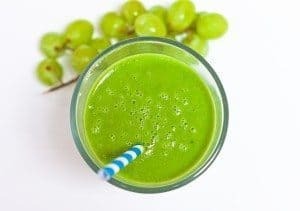 This basic green smoothie recipe is a healthy breakfast for weight loss that lets you get in a full serving of vegetables that tastes delicious! Sometimes I make the entire recipe ahead of time and freeze the smoothie in plastic bottles that I move to the fridge the night before for them to thaw. Sometimes I make freezer packs of most of the ingredients and make a fresh smoothie in the morning. Pin These Healthy Recipes for Later!